After New York Fashion Week comes London, one of the world’s most inspiring cities and a breeding ground for new design talent. Here, we go beyond the whirlwind of shows, meetings and street style to discover five hidden treasures off fashion’s beaten path. As bookstores go, Maison Assouline is pretty special, and not just for the sensational selection of covetable coffee table tomes. At the heart of the high-ceilinged space — a former bank designed by Sir Edwin Lutyens — is Swans Bar, a tranquil refuge from the bustle of Piccadilly serving excellent coffee, cocktails and a French-inspired daytime menu. We especially love the afternoon tea served between 3 and 5.30pm; choose from Moroccan (fresh mint tea and homemade biscuits), Japanese (green tea with Japanese sweets) or French (served with foie gras and éclairs). Maison Assouline, 196A Piccadilly, London W1J 9EY. This atmospheric property in Spitalfields is an experience that sheds light on history by stimulating the senses. In the tradition of Dennis Severs, the artist who once lived in the house, visitors are invited to explore the 18-19th century lives of a family of Huguenot silk weavers. Scent, sound and half-eaten plates of food are used to suggest that the inhabitants are very much still present, to make the visitor feel like they have stepped into a painting. Dennis Severs’ House, 18 Folgate Street, London, E1 6BX. 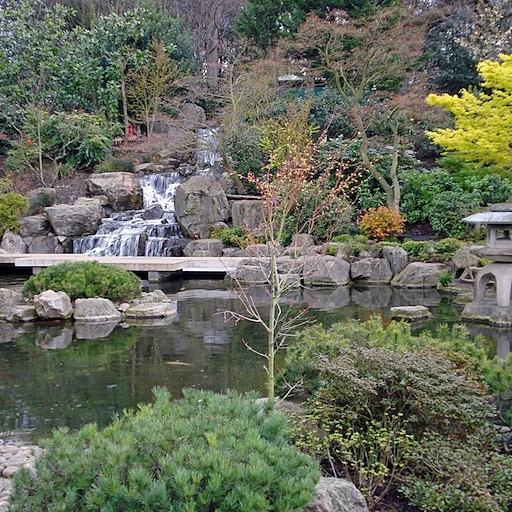 If you’re seeking a moment of zen, seek out the Kyoto Garden in Holland Park, one of London’s most picturesque green spaces. The ‘kaiyu-shiki’ (promenade-style) garden was a gift from the city of Kyoto to represent the friendship between Japan and Great Britain. Designed and built by specialist Japanese landscape gardeners, it boasts a waterfall and koi pond amidst the maple trees, which are particularly beautiful in the fall. The park is home to a number of peacocks, which often venture into the Kyoto Garden, making for spectacular photo opportunities. God’s Own Junkyard is the largest collection of neon signs in Europe and well worth the trip to Walthamstow in the east end of London. It was assembled by the late neon artist Chris Bracey, whose clients ranged from Stanley Kubrick to Soho strip clubs. It is only open on Fridays, Saturdays and Sundays, but visitors are invited to linger for a drink at the Rolling Scones Cafe. Gods Own Junkyard, Unit 12, Ravenswood Industrial Estate, Shernhall Street, London E17 9HQ. Hidden in the beer garden of East London’s Cargo nightclub are two of street artist Banksy’s most famous works. One is a ‘Designated Graffiti Area’ sign accompanied by a security guard with a poodle on a leash; the other is ‘His Master’s Voice’, a depiction of the now-shuttered HMV chain’s gramophone and dog logo in which the dog is aiming a rocket launcher at the gramophone. You can see the former through Cargo’s side gates, adjacent to the entrance. Cargo, 83 Rivington Street, London EC2A 3AY.